If it had been pouring rain, I’d have thought this Korean BBQ restaurant, Quarters, a scene straight out of Blade Runner. This was LA, after all. A dark and moody atmosphere with thudding, loud music. Grills inset into the tables, billowing with savory clouds of smoke. Waiters in black showed off mad skills with tongs and scissors. The meat just kept coming! Small plates offered up greens, sprouts, scallion pancakes, pickled veggies, and all manner of hot sauces. It was exotic and delicious. This was September, 2018. I guess I’m still catching up with myself. This might have been my favorite dining experience while traveling last year, although the taco truck a few blocks away was a close second. And the place at the base of Mt. Hood was really good, too. The taco truck had a line that snaked through the lot out onto the street. The good ones always do. A lot of humanity there: the mother holding a vomiting baby, a dog licking up the puke, earning him a kick from a four year old (wonder where he learned that), a lanky, tall guy begging up and down the line. It was a well-practiced spiel. You kind of had to respect that. He worked at the church just over there. No, he wasn’t a user. He wasn’t begging, in fact. Okay, sure. I abandoned the line to go over and watch the pork carver — a young man skilled with a knife. I loved to watch him flip pineapple chips into the open taco waiting in his other hand. Such precision! Such drama! Poor K was left in line, the lanky guy continuing on without missing a beat. Like I said, admirable. We ended up giving him and a few other homeless men money that trip, but it felt useless, maybe? They were everywhere. Chapped feet. Carts with sleeping bags. Those haunted faces. A problem so much bigger than emptying one’s wallet on a Saturday night. This was nothing, my son told us. We oughta see ‘tent city.’ Blocks and blocks of the homeless. Like a refugee camp. Instead, we went to one of the most interesting and beautiful monuments to wealth on the planet — the Getty Museum. One of Getty’s admirable legacies? Admission is free. Five months is a long time, sometimes. This five months was. The ongoing onslaught of news, turning weeks into months and months into years. My sister’s decline. D’s success with EMT training. A break up. And it just. Keeps. Coming. Today, Barr will be appointed AG. Already dipshit in chief has offered his quid (or is it his quo?) — a position on the WH legal team for Barr’s son-in-law and a position in Treasury for Barr’s daughter. No wonder a nice meal ranks high on the list of good experiences these days! This entry was posted in food, Out and About and tagged korean BBQ, los angeles, quarters, restaurant on February 14, 2019 by deemallon. After run to SSA in Waltham, stopped at Russo’s — grocery extraordinaire (and cheap). It was me and the Sicilian widows and old Chinese ladies. Love me some baby bok choy and black rice. For some reason, lately I’m wanting to turn bits of patchwork into pouches. The road today. Some puddles hiding sheets of ice. This entry was posted in every day life, food, piecing and tagged every day, grocery shopping on January 24, 2019 by deemallon. 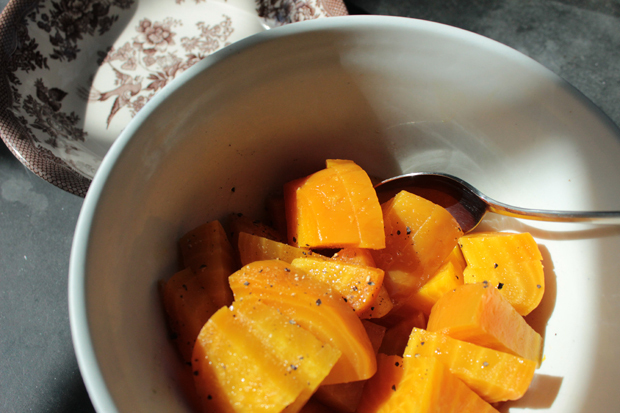 In the colder weather, we want sturdier, starchier foods. The craving applies to salads, too. This selection of ‘cold weather salads’ relies on typical pantry items, which means with a well-stocked larder you can make most of them with little or no planning. Nothing like toothsome barley to satisfy the need for something deliciously starchy! Add some chic peas, diced red onion, chopped green olives and orange pepper, toss with parsley and a vinaigrette and you’ve got yourself a Company Worthy salad! Unlike many others, this holds for days in the fridge. 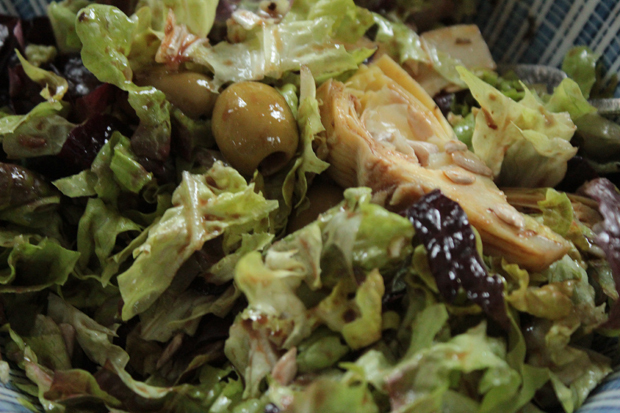 Dress up red leaf with some deli-style olives and artichoke hearts out of the can. Yum! While I generally prefer white or rice vinegar, a balsamic vinegar adds to the visual sense of a dark and hearty mixture. 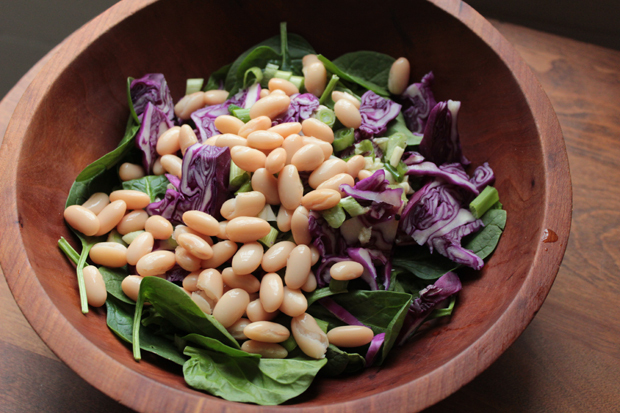 Sunflower seeds and cannellini beans, both readily kept on hand, dress up any salad — here find them nicely partnered with spinach and red cabbage. 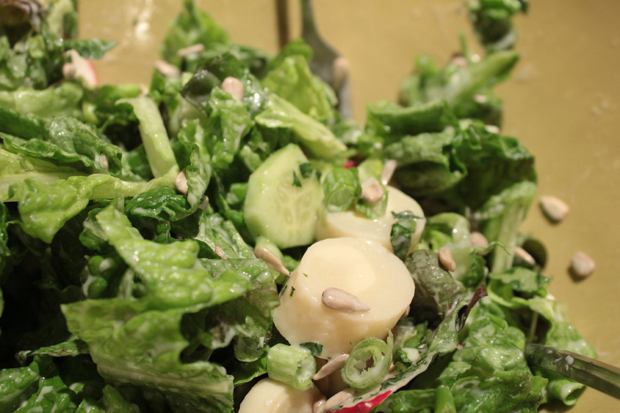 Hearts of palm and again, sunflower seeds, turn an otherwise pedestrian salad into something a little special. 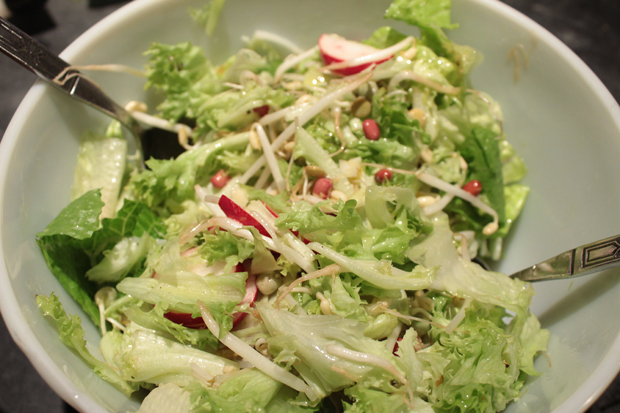 Scallions and radish add pizzazz. The dressing here is Marie’s Lite Blue Cheese mixed with lemon and garlic. It’s the only store bought dressing I ever use. If you’ve a brand you really like, let me know! 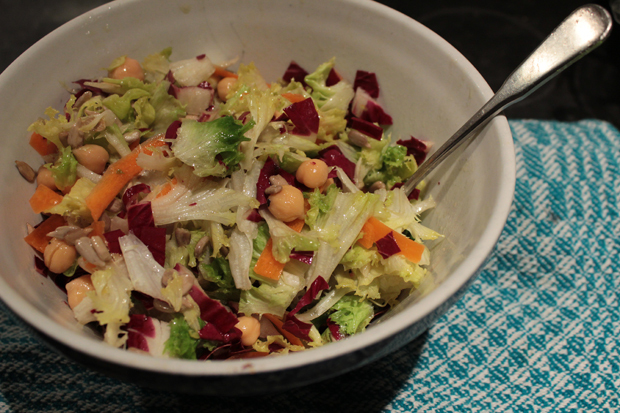 Generally, I find that little compares with homemade mustard/garlic vinaigrette. 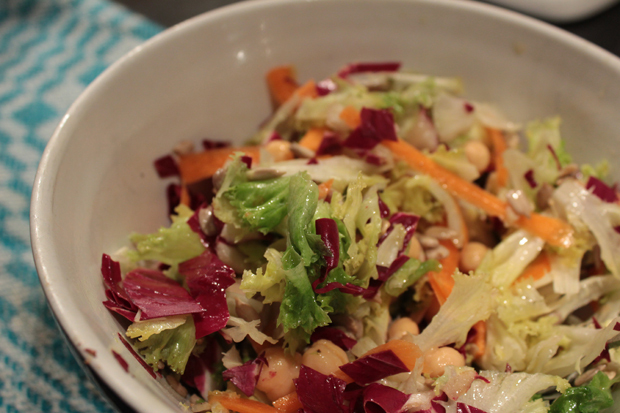 This salad combines radicchio, sunflower seeds, chic peas and carrot ribbons with bitter greens. In the cold weather, it’s nice to have pops of color on our plates and even though we associate bitter greens with spring, they’re available all year ’round. 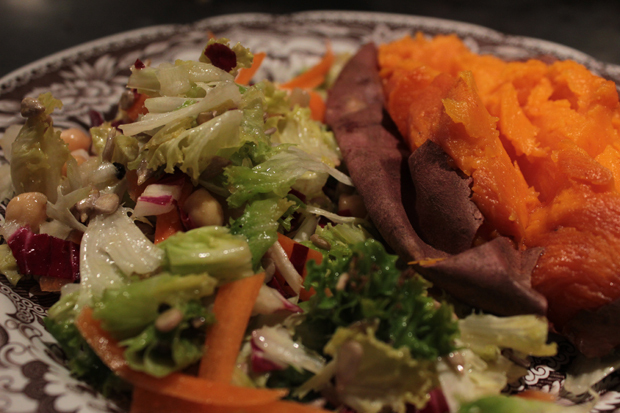 Partner with a sweet potato for a light, mid-week meal. Roasted beets of any color constitute a real treat in my book. Wrap them in foil, throw ’em in a medium oven for an hour, use the foil to scrape away the skin and voila! — you have a tender, sweet vegetable that really needs no adornment. 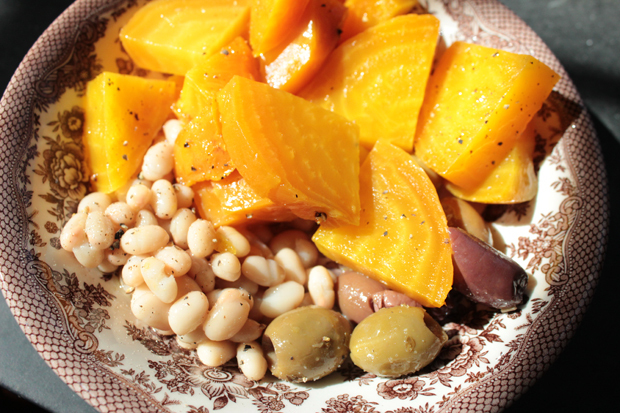 Here, I’ve mixed yellow beets with canned white beans, olives and lots of pepper prior to dressing with a vinaigrette. 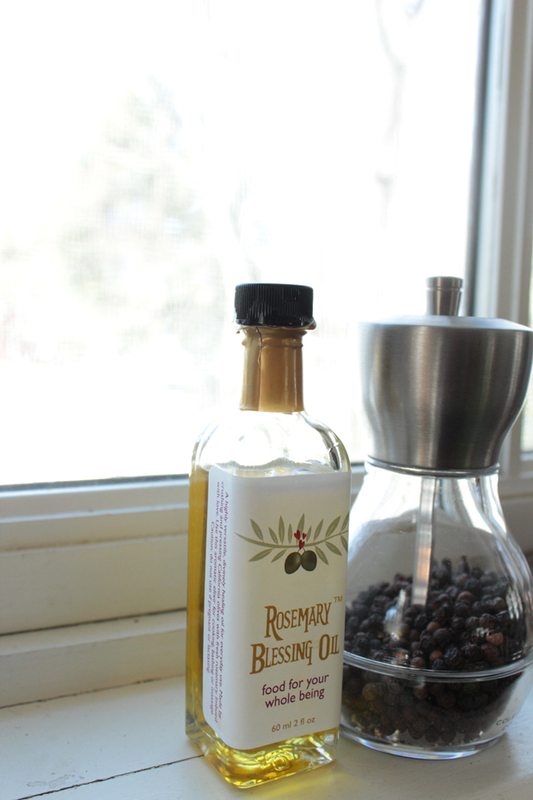 If my friend Elizabeth ever produces another batch of this exquisite oil, I’ll let you know. 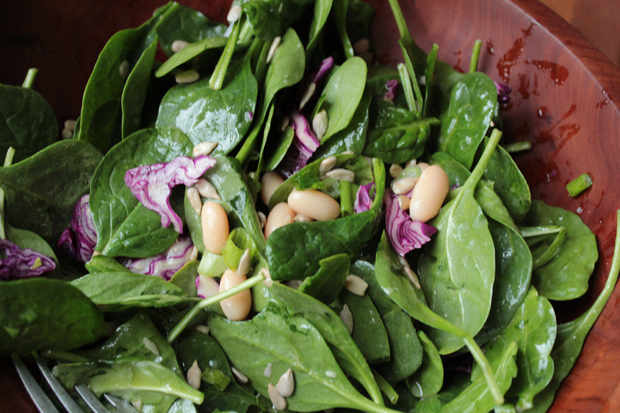 It’s delicious on salads and good for direct application to hair and skin, too. 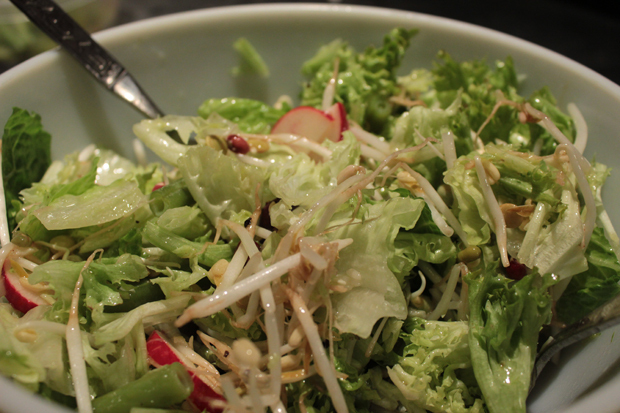 Escarole, mung bean sprouts, and radishes. 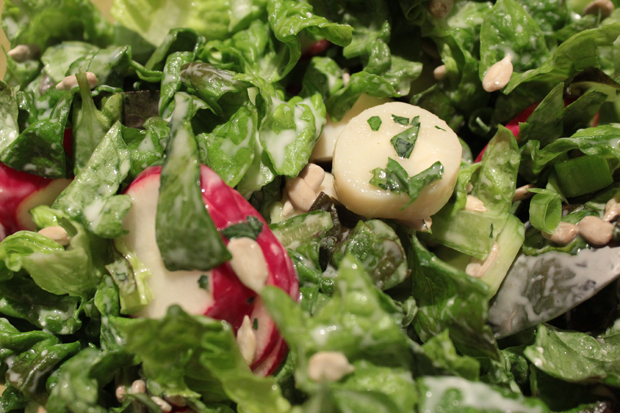 Not sure why this salad made it into the ‘cool weather file,’ but I’d eat it this late November week for sure. 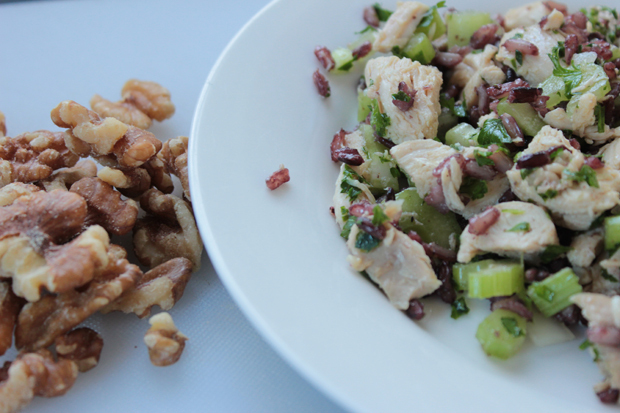 Chicken Waldorf Salad is special any time of year, but in November it’s particularly satisfying. I’ve skipped the greens and the grapes and added wild rice. 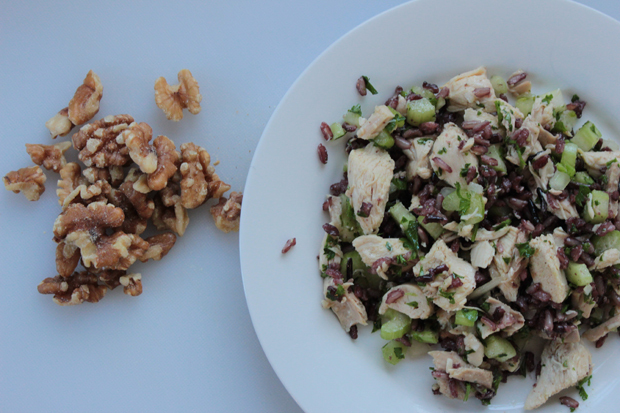 Walnuts are a must, as are celery and some kind of onion. I didn’t do so here, but roasting the nuts briefly in a saute pan brings out their flavor. This is a wonderful use of leftover chicken. This entry was posted in food, Salads and tagged cold weather food, food, recipes, recipes for cold, salads on November 26, 2018 by deemallon. Happy Thanksgiving American readers! Yes, I’m using French’s crispy onions for the green bean casserole topping but I’m firmly drawing the line at mushroom soup. Made a roux with real butter and real cream. Tons ‘o fat. I hope my sister in law’s too busy in the kitchen to read this because otherwise she might not have a serving! Per usual, I found a great Bon Appetit recipe online. The hardest part was finding the setting on my phone to keep it awake. Greasy fingers and passcodes make for an unhappy partnership. Sometimes when I’ve had it with the news (just hearing “Saudi Arabia” turns my stomach), I play with the dianaphoto app and make double exposures. It’s truly fun. (K and I may have gone out for burgers last night as a pretext to stop in at the Pottery Barn — how I love their Christmas displays! All that sparkle and dazzle show up nicely in photographs). Here are a few pix. I’ll save most of the Christmas ones for (ahem) AFTER Thanksgiving. The skyline is Charleston from 2017 visit. The peace pin was a gift from Liz (I’m Going to Texas, sidebar) and created by Barry Smith of Australia. This entry was posted in family, food, In the Company of Cloth and tagged dianaphoto, green bean casserole, thanksgiving on November 22, 2018 by deemallon. The first memorable meal of our trip was also our first meal and served in the stately Timberline Lodge at the base of Mt Hood. I said something but didn’t let it ruin lunch and only write about it now because it offers a soft echo to what is happening on the national stage. Whom do you reflexively believe? Whom do you reflexively discount? And why? And what about capitulation? There are so many moments when I had no dispositive photo to bolster my view (so to speak), when my go-to reaction would’ve been self doubt. “Um, I THINK so.” This pattern is part of why I find the push back by Dr. Ford’s lawyer so riveting. She offers some willingness to bend but it arises from strategy, not doubt. The Pork Posole served to K and me was out of this world! I had to substitute frozen corn for hominy and used less heat, but my version was still delicious. Apply dry spice rub onto a pork shoulder after removing some of the fat and silver. I used a combo of chili powder, onion salt, and a prepared Moroccan spice mix. Sear top and bottom in a Dutch oven covered in olive oil — about four minutes a side. Rather than sear meat first, remove, then add veggies, I now add onions etc. while cooking the meat so that the pan doesn’t smoke. For this dish: add one onion sliced in half moons, three whole garlic cloves and one cup of dry black beans. Bake at low heat for three hours. Bring to a boil. Simmer briefly. Serve atop rice. Shredded cheddar optional. A great meal for cooler weather. Will be better the second day. *I stowed away enough meat for two pulled pork sandwiches and still had plenty for the Posole. This entry was posted in food, Out and About and tagged mt Hood, pork, Pork Posole, says who, Timberline Lodge on September 22, 2018 by deemallon. Diced base of green pepper / Small chunks of half a tomato / two celery stalks, chopped / 3 Tbs diced red onion / small handful of chopped endive / half a chopped avocado / one small cuke, peeled and chopped / chopped herb (cilantro or parsley). Tasty with all kinds of dressings but my favorite is a tangy vinaigrette. This is a single serving. Great opportunity opened up last night: got a space at a writing retreat. I had moved on it late. It was full. Forgot about it. And then: ta da! I was first on the waiting list and a spot is mine! Not only is it being held in my old stomping grounds just outside of Northampton in central Mass., it’ll be DAYS dedicated to writing and feedback. The timing couldn’t be better! Brutally hot here again. Finn and I started our day in the lake! I’ll be taking about a week-long break here. This entry was posted in Salads, writing and tagged salad on August 2, 2018 by deemallon.